I’m the type of person who plans their meal around the dessert menu when I go to a restaurant, and while on holiday in France recently, I had fondant au chocolat for dessert three times in eight days. I’ve mentioned before that I’m not a huge fan of chocolate cakes, because they’re usually not intensely chocolatey enough for me, and tend to leave me feeling somewhat ‘meh’. 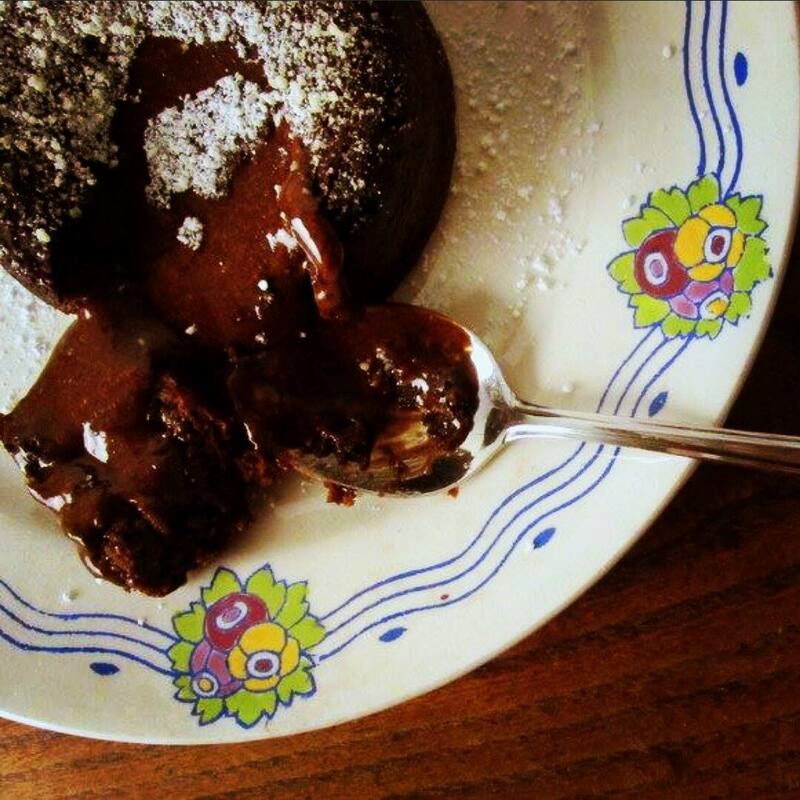 But I’m a huge fan of ooey gooey lava cakes, or chocolate fondant cakes, depending on which part of the world you’re from (or in!). Most of the ones I’ve had in restaurants have been somewhat lacking in chocolate intensity though, it’s really important to use good quality dark chocolate for these, and lots of it. Only one out of the three I had in France truly hit the spot, it was just the right amount of dark chocolate, not over-baked, and served with cherry ice cream. And it was gooood. Please forgive the quality of the pictures – I decided to make these on a whim this evening = zero natural light 🙂 But that’s one of the best things about these cakes – they have so few ingredients and are super quick to make; and they really hit the spot. My friend Nadia and I ate them whilst watching The Wedding Singer (an awesome movie, even for people who aren’t big on Adam Sandler) and drinking Cava. I’m nothing if not classy. Preheat your oven to 225˚C ~ 450˚F ~ gas mark 8. 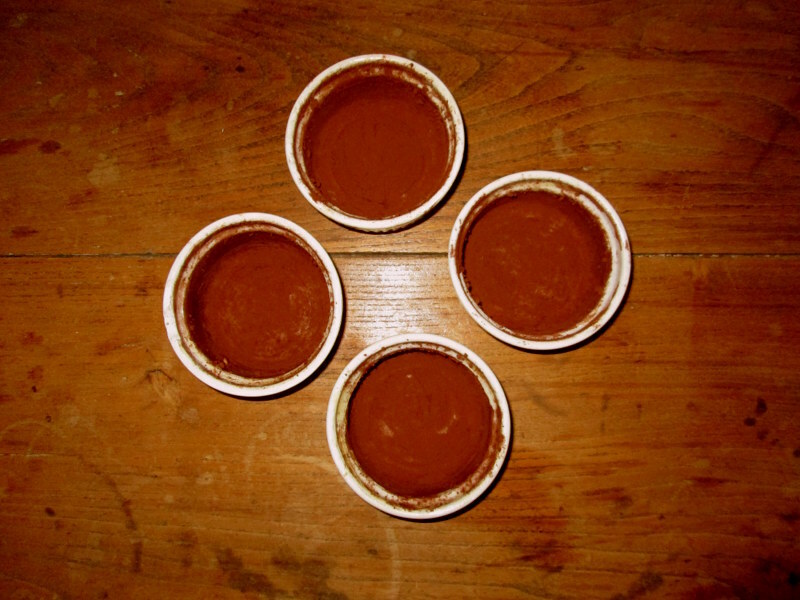 Butter four ramekins generously, and dust with cocoa powder so that the bottom and sides are well coated, by pouring a bit of cocoa into the bottom of the buttered ramekin and gently tapping it over the sink while turning it, to evenly distribute the cocoa over the bottom and sides (you can also use flour, but I find that this sometimes leaves a bit of white residue on the finished cakes). 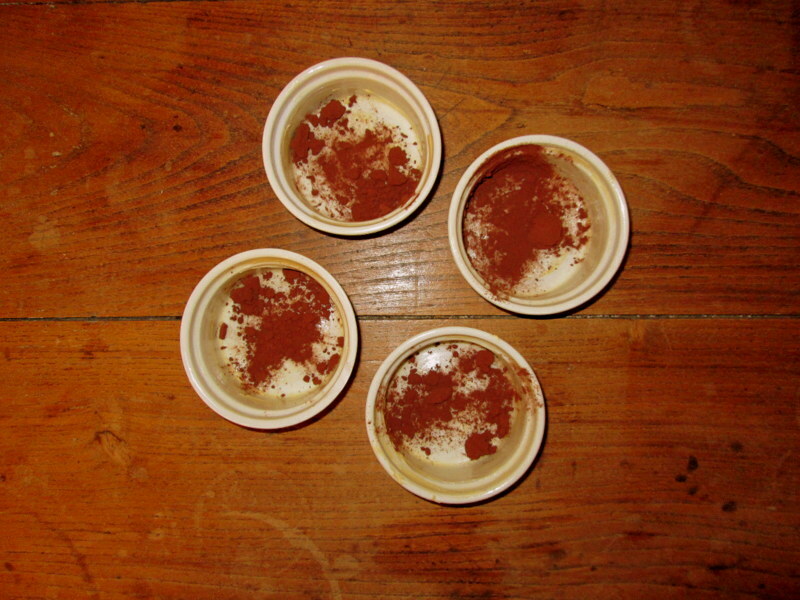 Set the ramekins aside on a baking tray. 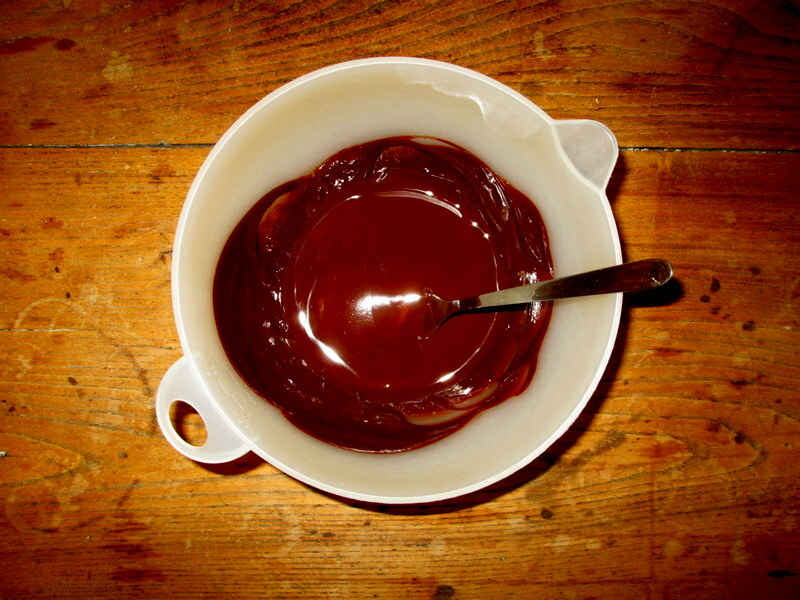 In a medium to large bowl, melt together the butter and the chocolate, broken into chunks, either in a bain marie, or by microwaving on high for 1-2 minutes until the butter has melted and the chocolate is dissolving, and stir until you have an even, glossy mixture. 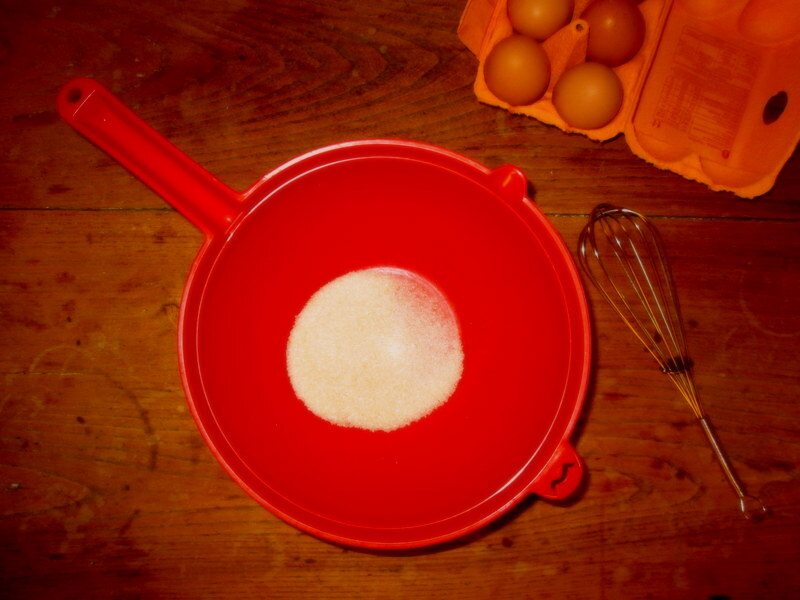 Whisk the eggs, egg yolks and sugar together in another bowl with an electric mixer, until light and airy. 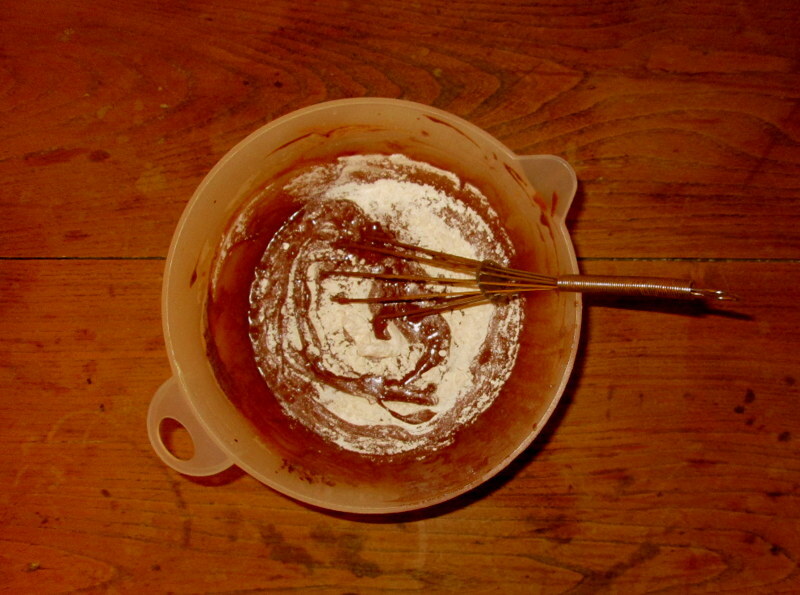 With a hand whisk, quickly whisk the egg mixture into the chocolate mixture, followed by the flour. Don’t over mix, only whisk until the flour is just incorporated. Distribute the batter between the ramekins. Either bake right away in the middle of the oven for 6-7 minutes (it’s really important to time this exactly and not overcook the cakes), or put them in the fridge or freezer for later use (in this case, don’t forget to cover the individual cakes in cling film). When the cakes are out of the oven, using oven mitts place your serving plate over each individual cake, gently turning it upside down. 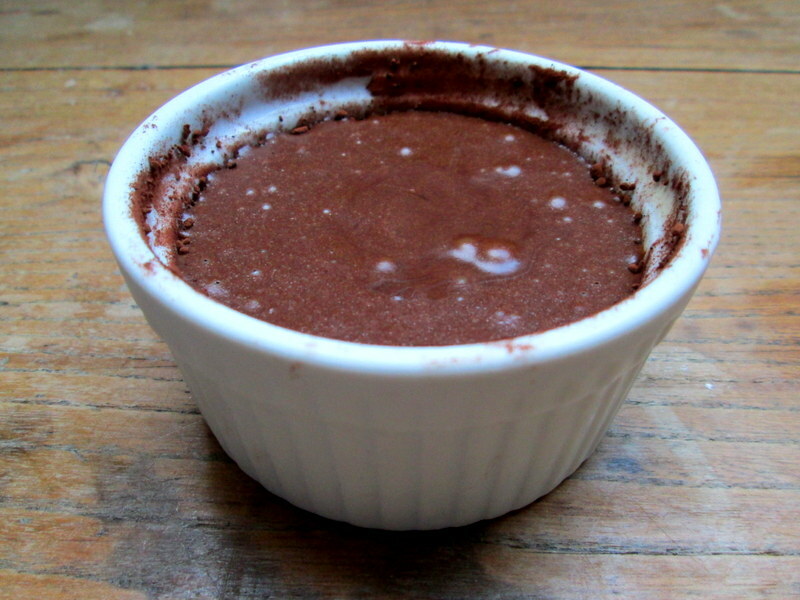 When you lift the ramekin up carefully, the fondant cake should come out with a gentle thud. Sprinkle them with a bit of icing sugar and serve right away (once out of the oven they’ll keep on cooking, so it’s important to serve them fairly quickly), either on their own or with ice cream; vanilla is a classic, but I really liked the cherry ice cream – it was just the right amount of tartness against the rich and gooey chocolate cake.